Sorry, I thought we were just throwing out things we wanted to happen. You know like your wee friend did with Club 42 being automatically relegated. What are you on about here? Incidentally I agree that the club who finish bottom of League 2 should be automatically relegated. Is that why you want Dunfermline to be relegated? Because you don't agree with that? What club has financial problems? Cowdenbeath next season by the sounds of things. I don't care about Dunfermline. My point was just why are we talking about things are can't just happen because you post saying you want it to. All the clubs in the SPFL would need to vote in favour of automatic relegation for Club 42 and it's unlikely to happen so why have an annual post about it. Just like there would be no point in my having an annual post about relegating Dunfermline just because. None as far as I'm aware but it's another reason that a club might get relegated. Ok. We best delete the majority of posts on this site then. Don't ever post about players you'd like to sign. Don't ever post about who you want to be a new manager. Don't ever post about who you want to draw in a cup competition. Don't ever post about what you want your new strip to be. Do you post the same point on a recurring annual basis or do you make your point and move on? Or are you still saying that we should sign x player 8 years on from when you first thought he'd be a good signing? That probably applies to most of the lower league clubs most seasons. Cove confirmed as Highland League champions earlier. We've tackled both contenders away in the last two weeks, beating Rovers 4-0 and Berwick 3-0. Neither look up to much, but Rovers looked a bit better; yesterday's result would tend to support that. I fear for Berwick; they were dire yesterday. No lack of effort, but the players looked below L2 level as a whole, and there wasn't much in the way of cohesiveness. We are a bit better than our position indicates, but we were streets ahead of them. They look on their last legs, and the fans, some of them as charming as ever, weren't slow to let them know what they thought. With Rovers getting a last minute point at bottle-dropping Peterhead, the finger of doom is pointing to the border. I'd like to hope that whoever hits the bottom, they'll survive in L2. another season of these c***s moaning about how everyone is against them when they get beat. 27th April Berwick v Rovers. A massive game for both and a draw should be enough for AR. Personally, I wouldn't be sorry to see Berwick go. Everyone is actually against them! 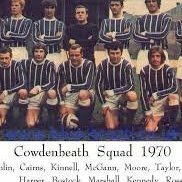 I don't think that there's ever been so much goodwill towards Cowden as there was when they played Cove. Certainly from the referee when the Cove goalie was rugby tackled and the goal allowed to stand. Think it was the goalie doing the tackling. Hope Cove get stuffed. Will try and make the Cove home games, still not been to their new ground yet. I feel you've got to fancy Cove to go up this season. Have you seen EK this season ? No, Only brief bits on YouTube. But I do think that Berwick/Rovers will be heading down.